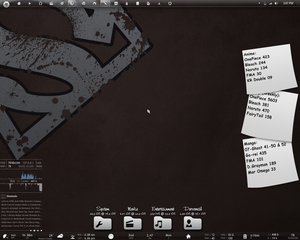 Between all the desktop customization packs and software the one that is really different is Rainmeter. But before you start thinking that its just an another customization pack just have a look at these desktop wallpaper customized by rainmeter. Rainmeter gives you full support to customize your desktop as you want. It provides you a lot of desktop widgets, which you can access by dragging and droping on your desktop as per you likes. Style sections! New MeterStyle makes skins easier to create/edit. Dynamic Variables! It's now possible to use the results of measures as variables. Share variables and settings globally with @Include. New LocalFonts feature means the user doesn't have to install your included font. Added support for the middle mouse button. New bang !RainmeterSetVariable can be used to change the value of a variable. New [Metadata] section to add and display skin information in RainBrowser. Aspect ratio of images is preserved when the images are scaled. You can however create your own skin with Rainmeter but if you are lazy like me than Customize.org provides a lot of skin support for rainmeter, just go here choose what you want and install. Last edited by riteshtechie; 20th November 2009 at 09:39. Have been using it for last two three months or so. Probably the best application to customize Windows 7 desktop.